Like many others who have the misfortune to suffer debilitating strokes, my father lost the function of one side of his body and lost his speech completely. When he was in his nursing home, I devised a visual pack comprising a series of cards with text and graphics, to help us as a family to communicate with him. The pack proved to be invaluable as a means of stimulating conversation, particularly when there were awkward or embarrassing silences. Other residents and nursing staff also said they found the cards very useful. When Dad died, we kept his personalized pack in the family as a reminder that we really had done everything we could to keep things normal for him, to make him still feel included in our everyday activities and to keep him as close to us as possible in the latter part of his life. 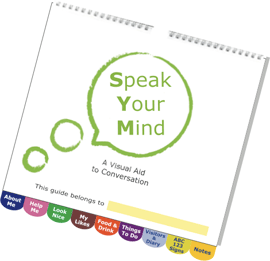 That pack has since been developed into the ‘Speak Your Mind’ visual aid, designed for people of all ages who cannot talk or whose speech is difficult to understand, and for their families, carers, professionals and others, all of whom will benefit from two-way conversation. The “Sym Guide” provides an intuitive tool to keep communications flowing, working on many levels. It’s an ice breaker, and both fun and practical to use. It’s a leveller, being able to communicate, to be understood is so important in all aspects of out lives, from general chat to consultations, from selecting food and drink to explaining how one feels.